Building an authority blog begins by defining and executing on a content marketing strategy. Walk through each necessary step to improve content marketing campaigns, which will, in turn, establish your blog as an authoritative knowledge center. Over 3 million blog posts will get written today. Yet, most will never get read. Oh sure, there’s always your mom, doting grandmother, and best friend. But as a business blog, you need readers that want to subscribe, share, and buy. So how do you gain momentum and turn your site into a valued and respected authority blog? As a blogger, becoming an authority in your field results in increased recognition, credibility, and business opportunities. You set that tone through your content. The more you write, create, and share, the higher your trust factor rises. Once readers trust your expertise enough to revisit, they’ll begin to share your content and even link to it — that’s your ultimate goal. To begin this process, you need a content strategy. In this post, we’ll look at the steps it takes to build a content marketing machine that positions you as the go-to leader in your industry or niche. Let’s start from square one and assume a couple things. You’ve been blogging for the last year, built some links, rank, and have a small but growing list of original articles. You’re in touch with experts in your niche, consider yourself to be knowledgeable in your field, and are ready to level up your results. Sound close? Even if I’m off, here’s the deal: No matter the stage you’re in, there’s always room for improvement. Below are the steps you should take right now to ensure your content marketing strategy isn’t half-baked or full of holes. While that might be true in the world of Hollywood and baseball, it’s a fallacy for bloggers. The only way to get readers to swarm to your blog is to add value continuously. And not just any content, but topics that speak directly to your core audience. It takes planning if you want to create articles that either solve a problem, help your readers make improvements, give hope and guidance, or act as a compass to show the way. Take this four-step PREP approach to define content marketing priorities and begin the orchestration of your content strategy. Perception: Analyze what you know vs. the real intent and struggle of your audience. Research: Write down your top three to four content objectives and key results. Execution: Create a content marketing posting plan and justify content mix through data. Profitability: Improve blog authority and monetize your content marketing efforts. Search engine optimization is an extremely important element if you want to generate the right traffic to your site. Doing your research and utilizing relevant keywords in your articles increases the likelihood that your target audience will find and land on your page. But SEO is so much more than that in 2017. You must invest in quality content, not just one-off or singular tactics. The right way to optimize is to commit to useful, consistent content that encourages people to comment, share, and link to it. When this happens, your blog gets genuine links that help to improve search engine visibility. But it’s not just articles you need to optimize. Consider every element on your blog and how your readers will interact with it. Whether they’re on desktop or mobile, their experience must be seamless. This doesn’t mean you immediately overhaul your blog design, but it does require a look at why device, screen, and consumption matter. A recent report from Hitwise states that in the U.S., mobile search is roughly 58 percent of overall search query volume. That’s based on an average of 11 key categories and associated queries analyzed by Hitwise in its “Mobile Search: Topics and Themes” report. Without a doubt, mobile optimization is key to your content marketing and overall blogging success. If you’re not currently focused on a mobile-first strategy, you likely won’t rank in mobile search results and that will be the death of your blog. Now is a critical time to redefine your optimization strategy. What’s the solution when building an authority blog? Deliver content consistently. When you provide value on a regular basis, you build familiarity with your audience. They become comfortable with you, your style, and your publishing calendar. Train them on what to expect: when you’ll post, how often, and what type of content they’ll see each time. The best way to stay consistent is to put a calendar in place. With an editorial calendar, you write with a purpose. You define your campaign structure, what you want to promote at any given time, and then you align all of your marketing efforts around those dates. Identify your themes and focus topics. If your target market is social media managers, your focus could be Facebook, Twitter, Pinterest, etc. The idea is to take their top questions or struggles and solve them. Research the intent of your audience, keyword supply and demand, and likelihood of ranking for that phrase. Brainstorm and write down as many as you can. Use a Google Spreadsheet to keep track so you can easily go back. Know where each post will fall in your content funnel. Is this an awareness, nurture, or activation post? Think of your customer journey first, content second, and then connect that to the stage your audience is in. If you’re looking for an example, the below graphic from Hinge is a perfect breakdown. 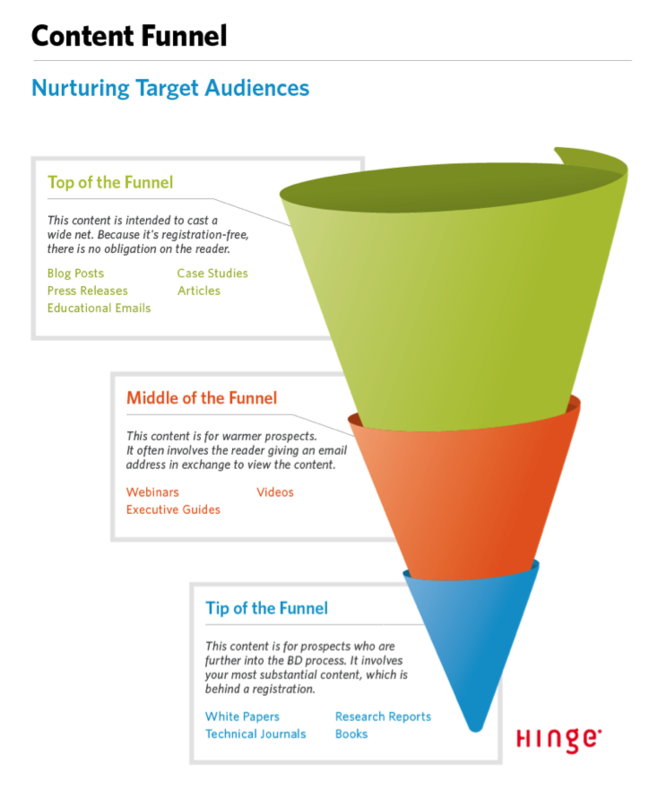 It shows where in the funnel and at which stage you should serve up content to your readers, followers, and fans. To build authority, you must be trustworthy. When adding any data, statistics, or quotes to your blog content, check the source. Make sure that the information you’re citing is valid, up-to-date, and credible. And don’t forget to link back to that original source — every single time. This helps you in several ways. First, you’re sharing (not stealing) someone else’s work when quoting it. Second, you’re providing data-backed evidence to support your content. Third (and equally as important) — you create an internet-friendly way of mentioning and attributing the original source (e.g., encourages shares, links through authenticity, etc.). This will build a trusting relationship between you, your readers, and those you’re citing. Trust is invaluable in online relationship building. You don’t want to tear down that wall before it’s even built. Consistently creating great blog content will naturally promote organic links. But you’ll need more than that to improve your global popularity and earn the badge of authority within your space. One of the most effective ways to get high-quality links to your site is through content marketing. Because after all, content your audience wants to continually reference or link to becomes an evergreen goldmine. It also goes a long way in building that trust you’re working to earn. In a study by Key Difference Media, 78 percent of consumers said customized content builds trust. But before you embark on content creation, remember this: Anything you create has to be relevant, authoritative, and high in perceived value. Otherwise, you’ll spin your wheels and burn out from frustration before you begin. So how do you get started? Write down four to five types of content you can create to continuously attract high-value links. This could be anything from an infographic to a video series to an e-book or a how-to download (e.g., checklist, template, etc.). Once you determine the content type you’ll focus on, map that to one of your top-performing blog posts. If you use Google Analytics, this will be an easy step. Take a look in Behavior → Site Content → All Content to find your top-trafficked posts. Now if you’ve been blogging for a while, determining your top content is a little bit more difficult. Only because times change, businesses change, and so do audience needs. Make sure you’re choosing the content that’s solving the needs of the audience you want (not necessarily the one you have). For the best blogging results, get to the core intent of your audience. This is the contextual search (i.e., what they’d actually type into Google or ask Siri). There’s a huge difference between that and traditional keyword research. The good news is that when you pair the right context with the right keyword — you have Google magic. That magic will translate into blogger authority. To do this, you need to know what drives readers to seek you out. What are they looking to find when they land on your blog? It might be that they want to read entertaining content. Or they may prefer to read jaw-dropping stats that share details around a passion. Maybe it’s educational content that they can’t find elsewhere on the web. Whatever the case, your goal is to discover their preference and then give it to them over and over again. Many marketing professionals spend a lot of time trying to build authority through link building. As I mentioned above, it’s one piece of the puzzle. However, simply focusing on links is a mistake. To avoid this altogether, focus on the quality and usefulness of your content. When readers like your content, they share it. When it’s shared, you send social signals to Google. As more people share, Google takes notice potentially raising your rank and authority. Want to know if your content has the shareability factor? Review your blog from the reader’s perspective. Do you make your posts easy to share? Do you use interactive content? Have you linked internally to other useful articles? Establish a YouTube Channel. Google adores YouTube, and they work well together when it comes to search engine traffic. Create video content and then embed that into your blog posts. This could be an interview, an answer to a FAQ, or a quick screencast showing how to do something within their business. As you consider your YouTube video strategy, also know how length affects your engagement. Wistia found that there’s a direct correlation between length and a video that gets tons of engagement. It seems two minutes is the sweet spot. Develop Your Internal Linking Strategy. If you’ve been writing for a while, you’ll have a nice pool of evergreen posts. These are posts that continue to receive traffic, create conversions, and bring new leads to you. Go to Google Search Console → Search Traffic → Search Analytics and review your top 50. Are these posts that you should be linking to from newer (fresher) articles on your site? Make it easy to regularly link back to relevant articles by adding these posts to a Google Sheet or Excel file. You want to create a scenario where no matter the question, you have the answer right there on your blog. Target Your Market. Let’s take an example of a laser beam. A laser beam that makes a hole does not shoot light in all different directions. It targets light in a steady beam to one place. The same thing applies to your marketing and blog writing. It’s far more efficient to channel your efforts to one target market. Because after all, if you’re speaking to everyone, you’re reaching no one. Writing and posting great content is only the first step. Once you hit publish, the promotion begins. Set your content up for success by promoting it intelligently. Research where your audience spends its time online. If your market is B2B, Content Marketing Institute found that LinkedIn is the most effective platform. Not B2B focused and want to quickly get an answer to this? Just ask! Send an email, create a poll, or post to Facebook. Find out where your readers consume the majority of their content — and be there. Caters to that unique social network and/or audience. Evokes emotion, taps into a need, and sets expectations. Balances promotion, customization, and personalization to create a seamless reader experience. Set up a Google Sheet to compare performance across all platforms simultaneously. There are a variety of reasons and benefits to building an authority blog. You increase conversation around your brand, become the recognized face and voice, and create valuable relationships. But just know that all of this takes time. Be patient and write. Then write again, and again, and again. The more you write, the better you get at connecting your blog with the exact right people. What’s been your biggest content marketing struggle? Share it here in the comments or with us over on Twitter @digitalcurrent.